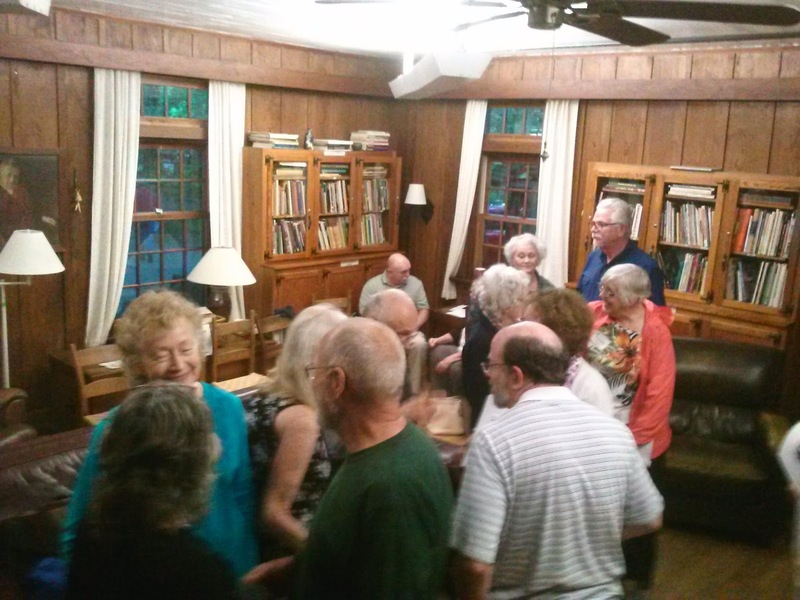 Poets and writers in western North Carolina recognize Dr. Gene Hirsch as the founder of the writing program at the John C. Campbell Folk School. He has taught poetry there for twenty-two years. 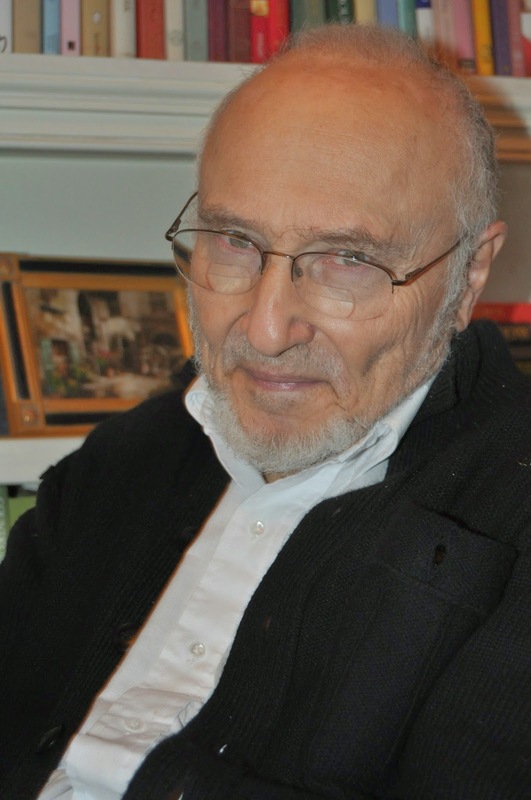 Writers Circle in Hayesville, NC will host a workshop, Inspiration and Poets’ Block, by Hirsch on Sunday afternoon, May 25, 1-4 p.m.
Gene Hirsch is a former professor of Medicine with over 50 years background in teaching human experience, meaning and values and the emotional care of sick and dying people to doctors and medical students. He has conducted poetry workshops widely for health professionals as an expressive adjunct to their caring experiences, as well as for poets in Western NC. His poetry has appeared in medical and non-medical journals such as Pharos (Medical Honor Society), Hiram Poetry Review, Pittsburgh Gazette, Journal of Medical Humanities, Fetishes (Univ. of Colorado), Journal of the American Medical Society, Human Quest. He has written two books, Along the Rutty Pot Hole Road and You Shall Die Again No More. Anthologies include Echoes Across the Blue Ridge, Tyranny of the Normal, Crossing Limits (African Americans and American Jews). He has produced five volumes of Freeing Jonah, poetry, from Western North Carolina. Writers sometimes feel they must wait to be inspired before they can create a poem. Often they feel blocked and become frustrated with themselves. Hirsch says, “Inspiration and writer’s block are two widely used, poorly understood antithetical terms. In this class we will study and share your views and experiences with these concepts.” He asks participants of this class, limited to 8 students, to bring a poem to discuss in terms of inspiration and meaning to the poet, and bring 10 copies. 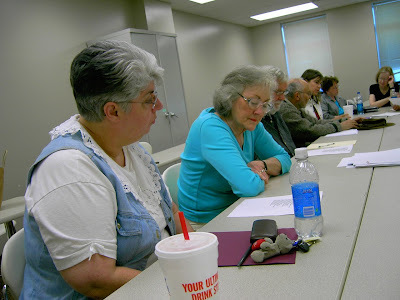 Western North Carolina and North Georgia is an area where poets have flourished in the past twenty years due to knowledgeable teachers such as Dr. Hirsch and Nancy Simpson of Hayesville. Poetry books by local writers are published each year. While writing is a solitary art, writers need community and coming together with others. To register for this poetry workshop, contact Glenda Beall, 828-389-4441 or email glendabeall@aol.com . Find more online at www.glendacouncilbeall.blogspot.com. Dr. Gene Hirsch and his John C. Campbell Folk School poetry class visited the Netwest Poetry critique group on Thursday evening, May 7. Linda Smith, far end on right, is reading a poem she brought for critique. Poets Glenda Barrett, author of When the Sap Rises, and Joyce Foster, author of Painted Leaves, a book Kathryn S. Byer called one of the most beautiful poetry books she has ever seen, follow the words of a poem read by Linda Smith. Joyce attended Gene Hirsch's class and lists him in her book as her mentor. Beyond Joyce in the photo is Clarence Newton, Gene Hirsch, Karen Holmes, Barbara Groce, and Maren Mitchell. 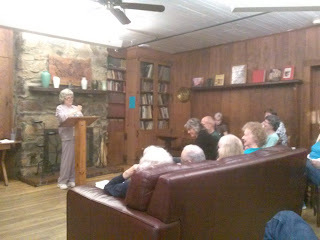 Dr. Gene Hirsch, a resident of North Carolina and Pennsylvania, teaches poetry classes at John C. Campbell Folk School. He has published five volumes of Freeing Jonah. The anthologies are collections of poetry from students in workshops at the Folk School and from poets in the region. Tonight I picked up my copy of Freeing Jonah V, published in 2007. Listed among the forty-five poets featured are a number of NCWN West members: Glenda Barrett, Janet Benway, Joyce Foster, who has a new poetry collection, Mary Michelle Keller, Brenda Kay Ledford, Mary Ricketson, Nancy Simpson, Linda Smith, Dorothea Spiegel and many more. My good friend, writer and poet, Estelle Rice of Marble, NC will be reading at the John Campbell Folk School next week. See sidebar. The following poem touches me in a special way. smoke from a Dutch Master’s Cigar. and homemade peach ice cream. in halls and hollow rooms. I shut the door and turn the key. JC Walkup from Canton, NC and Paul Donovan from Murphy, read to an enthusiastic audience at John C. Campbell Folk School Thursday evening. Dr. Gene Hirsch and students in his current poetry class were present for the reading, as well as Nancy Simpson, writer-in-residence at JCCFS. 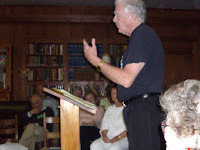 Paul Donovan told the group, representing many different states in the United States, that they were in the presence of some very important people to writers in western NC. 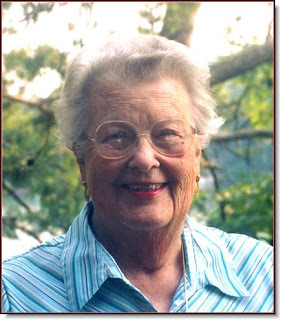 Dr. Hirsch founded the writing program at the folk school, and Nancy Simpson brings in the wonderful faculty each year. Nancy served as Program Coordinator for Netwest for 13 years and continues to mentor and teach poetry. JC read a gory horror story which kept the listeners on the edge of their seats. Her husband Bob says JC finds ideas for her stories wherever they travel. Just one little incident can grow into an interesting mystery. Paul Donovan gave one of his very best readings ever. With his tongue-in-cheek humor his poetry often ends with a twist, but a little of the dark slips into his work occasionally. Reading in May, on the third Thursday, will be Shirley Uphouse, non-fiction writer and Brenda Kay Ledford, award winning poet. Time is 7:00 p.m. at John C. Campbell Keith House living room. I've spent most of today working on schedules and calendars for our writers in NCWN West. The John C. Campbell Folk School has hosted a monthly reading for our members for several years, and I try to set up our yearly schedule early. This year we start in February and run through November. Only July is skipped due to a conflict with JCCFS events that month. We still have a few slots to fill in that schedule and will have that finished soon, I'm sure. This year we are happy to have Nancy Purcell from Brevard, Michael Beadle from Canton, Jayne Ferrer from Greenville, SC reading at JCCFS along with many of our local members and others who have read in past years. JCCFS is a wonderful venue for us because the audience often consists of people from far away states and even other countries who come to this wonderful school to study crafts and arts of all kinds, including writing. Jan Davidson and others at the Folk School produced a documentary about the history of the school and it has now been nominated for an Emmy Award. The documentary is available on DVD by contacting the Folk School at www.folkschool.org. It is well worth the cost. 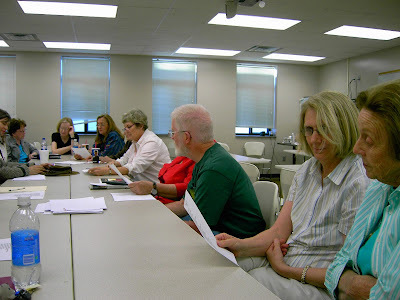 Twenty-three writing classes have been scheduled this year by Nancy Simpson, resident writer, and among the instructors are Nancy Peacock of Carrboro, NC. Check her out at www.nancypeacockbooks.com . I met Nancy briefly at the NCWN Fall Conference and I hope to take her class at JCCFS. Nancy Simpson and Gene Hirsch teach the poetry classes at JCCFS. They have inspired many writers to become poets. As I plan the schedule and calendar events for Netwest, I promise myself not to overschedule myself to the point where I have no time for my own writing. But it gets harder and harder to do. I will teach a week long class at JCCFS this spring. Your life - Your Stories begins March 16. If you haven't been to John C. Campbell Folk School to take a class, you must put that on your schedule for sometime soon. It can change your life.